Rolling with My Peeps Nothing says spring to writer Howard Yoon like Peeps. The squishy, marshmallow animals have a devoted following. A chocolate marshallow pie is a perfect way to savor them. 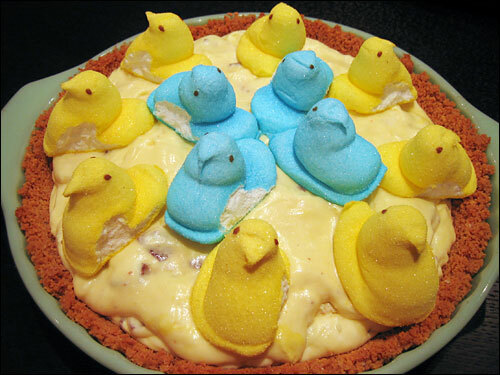 Peeps in a pie: What could be more delicious? Scroll down for a chocolate and Peeps pie recipe. When the white dogwood and pink cherry tree blossoms start to bloom along my street, I know one of my favorite springtime migrations is under way: Millions of fresh, newborn Peeps are making the great journey from their birthplace in Bethlehem, Penn., to destinations all over the world. This annual tradition has turned a classic Easter tale of rebirth and renewal into a kitschy celebration of spring. And every year, I make sure to spend some time chilling with my Peeps. According to a spokesperson from Just Born -- the company that manufactures Peeps -- one billion of these squishy, marshmallow delights will fly off the shelves in the weeks leading up to Easter. Why Peeps for Easter? The tradition dates back further than company history -- way back. Ancient pagans in Europe used eggs, chicks and rabbits as symbols of renewal in their spring rituals. Over time, European Christians incorporated the pagan symbols into their Easter traditions, and brought them to America. Howard Yoon is the creative director of the Gail Ross Literary Agency in Washington, D.C. He has written and edited numerous non-fiction books. One of those individuals was Sam Born, a Russian immigrant who learned how to make fine chocolates while living in France. In 1910, he moved to New York and a few years later, he opened a small store in Manhattan where he sold his "Just Born" fresh chocolates. After a move to Bethlehem, Penn., in 1933, Just Born acquired the Rodda Candy Company, a jelly-bean manufacturer that also offered handmade marshmallows that resembled chicks. These odd-shaped candies intrigued Born, and by the following year, his company was mass-producing them. Sales took off, and Just Born quickly became the largest producer of marshmallows in the world. Now, more than 50 years later, Peeps come in five colors (in order of popularity: yellow, pink, lavender, blue and white) and assorted shapes (bunnies, pumpkins, valentines, eggs, snowmen). But the original Peep has always retained the same, strangely blobby physique: two eyes that resemble benign skin moles, a sharp hooked beak, and an underbelly shaped like a rocking chair. How do you eat your Peeps? Some light them up like campfire marshmallows, others let them get stale first. Then there are those who enjoy playing or making art with them. One of the best games involves Peeps "jousting." To do this, attach a toothpick to the sticky white marshmallow side of a Peep. The toothpick should be horizontal to the ground, resembling a lance in attack position. Place two Peeps opposite each other in a microwave. Turn the power on high and let the games begin! The Peeps will puff out until one of the toothpicks pierces its foe -- or until the microwave makes both Peeps explode like characters in a game of Dig Dug. Since both sides get nuked, there are no real winners in Peeps jousting. But it is one hell of a Peep show. I like to avoid the whole "how to eat Peeps" debate by melting them and making a chocolate marshmallow pie. Start by melting the Peeps in a double boiler and cool them in a graham cracker piecrust with folds of light whipped cream and chunks of chocolate. Using Peeps instead of plain, white marshmallows give this pie a sweeter taste, thanks to the sugar-coating on the Peeps. This sweetness can be offset by a touch of brandy in the whipped cream. This recipe creates a pie filling of a lovely, canary-yellow hue. If you dare, you can decorate it with green-dyed coconut shavings and whole Peeps on top. Another variation is to substitute the semisweet chocolate with one or two crushed toffee bars, which are a perfect complement to the marshmallow. Preheat oven to 350 degrees. Pulse graham crackers in a food processor until fine. Mix butter, sugar and crushed graham crackers in a bowl. Press mixture evenly into the sides and bottom of a 9-inch pie plate. Using a double boiler, stir in hot milk and Peeps until fully melted and uniform in color. Allow to cool to room temperature, 7-10 minutes. Do not allow mixture to stiffen. Whip cream to stiff peaks using a hand blender or kitchen mixer. Add brandy during mixing. Using large rubber spatula, fold whipped cream and chocolate pieces into the Peeps mixture. Make sure all of the ingredients are thoroughly incorporated. Pour into graham cracker pie shell and refrigerate several hours or overnight. Garnish with green coconut (see below), whole Peeps and/or more chocolate pieces. This recipe is adapted from the official Peeps Web site. Continue to add 2-3 more drops to achieve desired shade of green. Spread colored coconut on a paper towel to dry.